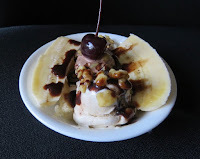 One can't have a banana theme week without at least one banana split with chocolate ice cream. Today's split featured: vanilla, walnut and Extreme Moose Tracks chocolate ice creams, walnut pieces, a cherry and, of course, a banana. What is Moose Tracks? 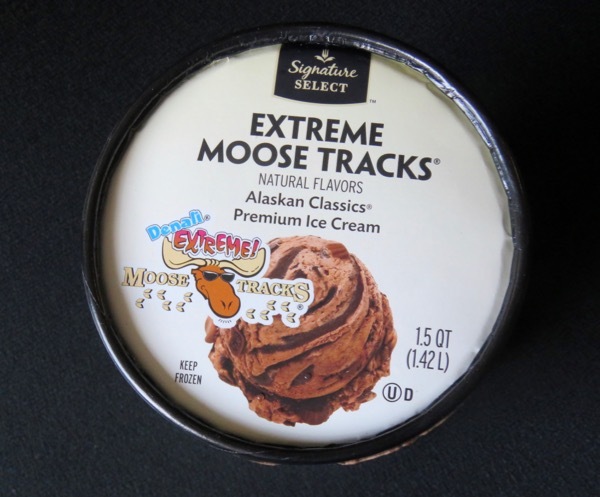 In the mid-1990s, Moose Tracks Fudge* became popular as part of an ice cream flavor of the same name. The original Moose Tracks ice cream was made of vanilla ice cream, Moose Tracks Fudge and peanut butter cups. 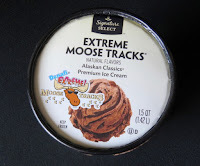 Today's Safeway's Signature Select Extreme Moose Tracks ice cream ups the chocolate ante and is made with a chocolate ice cream base with fudge cups and pieces of Moose Tracks Fudge. *The folks at Denali Flavors, Inc. (Michigan) have expanded the Moose Tracks line to include ice creams, cheesecakes and milks.